1. Hopscotch will keep them entertained for hours! Not only do they get to design their board, but they also get to make up their own rules. 3. The fun doesn’t have to stop when the rain starts to pour. Get their rain booties on and have them draw on the soaked sidewalk. The colors pop and blend to make for a masterpiece. 4. If they are stuck on what to draw, tell them to outline you and draw their favorite aunt! 5. Ran out of chalk? Don’t run to the store, do it yourself! With this recipe, you can make chalk into many different shapes, sizes, AND smells. 6. Spark their creativity: have the kids design and compete in their very own obstacle course! It will be the most colorful race they will ever participate in. 7. Take a photo before the chalk washes away and then surprise your niece or nephew with a framed photo of their chalk art! 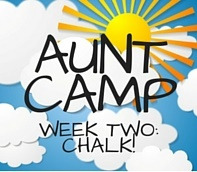 Home Activities AUNT CAMP 2: Chalk!